Just when we thought that the Hawks (the Directorate for Priority Crime Investigation) had finally got their claws out of South Africa’s Finance Minister Pravin Gordhan, they’re back! 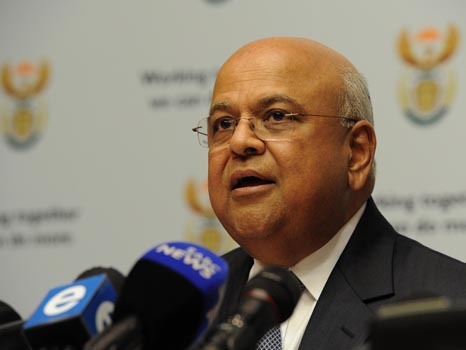 Conveniently waiting until after the local elections, they have once again subpoenaed Gordhan regarding alleged irregularities while he was head of the South African Revenue Service (SARS). Rumors are circulating that the finance chief will soon be arrested. Their first attempt at “having a go” at Gordhan ended with egg on the faces of Hawk investigators and the newspapers that supported their efforts. Allegations that the finance minister was illegally running a secret intelligence unit were revealed to have been nonsense—misinformation leaked to a gullible press (some of it owned or partly owned by President Jacob Zuma’s cronies). The Hawks are now also investigating whether Gordhan approved the early retirement and subsequent rehiring on a fixed-term contract of a SARS deputy director, Ivan Pillay. The latter happenstance, in effect meaning that Pillay would receive his pension but still work for SARS, may strike many observers as odd, but it is often done in South Africa as part of affirmative action retirements. (A government employee, usually white, would retire early but would work on a part-time contract, often mentoring his or her successor.) There is nothing illegal in that. The issue of the secret intelligence unit is a little more complex. Gordhan has admitted that he set up an investigative network within SARS to look into tax evasion and other crimes against the treasury. South African law here is oddly phrased, but it does empower a government department to investigate matters pertaining to its work. In other words, SARS can investigate tax evasion, even covertly, except when such matters may relate to the security of the nation. In short, it seems that an anti-Gordhan witch hunt is on again in a campaign South-African media have dubbed #SarsWars. President Jacob Zuma has insisted that he fully supports his minister of finance and believes him innocent. But he claims he can do nothing to stop the investigation. The legal expert Pierre de Vos believes otherwise: Under the law Zuma could have the head of the Hawks removed or suspended for a variety of reasons, including misuse of his office. But he hasn’t. Or more likely, he won’t. Fundamentally, Gordhan and his director general in finance are in a battle with Zuma and his political and economic allies over bailing out the essentially bankrupt South African Airways. The airline’s collapse is widely believed to be the result of mismanagement and corruption from on high by its directors, who are Zuma appointees. It is also widely believed that some of these appointees have been unduly influenced in their duties by the Guptas, a wealthy Indian family that has in the past profited through what many perceive as a corrupt relationship with Zuma and associates. Behind this latest attempt to unseat Gordhan looms another potential scandal: corruption in a nuclear power station procurement process. The state has been trying to expand its electricity capacity by building new nuclear power stations. People closely connected to the president have been wooed by the Russian energy firm Rosatom, despite opposition from environmentalists and economists. The latter charge that plans for costly new nuclear plants are potentially disastrous in an already financially strapped country. Worse, Rosatom’s bids are higher than others tendered for the work. It is rumored that in a reprise of an infamous 1999 arms deal, bribe money has already passed among the key players; and it is said that contracts have already been signed in secret. If any of this is true, public finance management processes have been violated by deliberate interference in state affairs by outside economic interests. This state capture, as it’s being called here, has been fiercely opposed by Gordhan, who is being supported by opposition parties, reform sections within the A.N.C., promoters of civil society like the Helen Suzman Foundation and veteran human rights lawyers like George Bizos. These actors are in a battle for the soul of South Africa, for good governance and for economic stability in the face of a slide into populism, corruption and state collapse. With Gordhan removed from the fray, that fight will be harder. This article also appeared in print, under the headline "Fighting for South Africa’s Soul? ," in the September 19, 2016 issue. Anthony Egan, S.J., is one of America’s Johannesburg correspondents.